lbs of juicy, sweet fruits just in time for Wimbledon! Supplied as pack of 10 Cambridge Favourite Class 1 Runners. 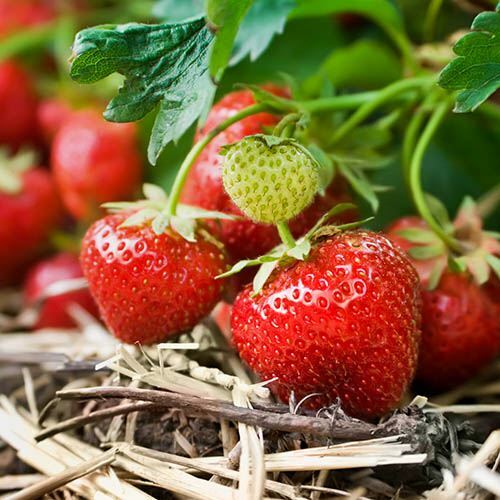 Cambridge Favourite is one of the most popular garden varieties grown in the UK, and these British bred plants are totally hardy and will provide lbs of strawberriesthroughout their lifetime. The strawberry runners are ready to plant now and will burst into flower and fruit this summer onwards. Nothing compares to eating sweet, juicy and delicious strawberries picked from your garden, and Cambridge Favourite reliably produces bumper crops of medium-sized orange-red fruits throughout June just in time for Wimbledon! Each one has a deliciously sweet flavour and if you can resist eating them fresh from the plant they are perfect for making jams and puddings! Each plant can produce up to 400g (1lb) of strawberries this June and more in subsequent seasons. They will be supplied as frozen runners so no need to worry about late frosts. They dont look pretty, but each one will have a small bud waiting to burst into life and loads of potential to grow and bear delicious fruit! Supplied as a pack of 10 Class 1 runners. Pick your strawberries first thing in the morning, when fruit is at its juiciest, and pick only ripe red fruit as orange berries won’t have developed their full flavour. Pick the strawberries carefully, complete with their stalks and green calyxes.